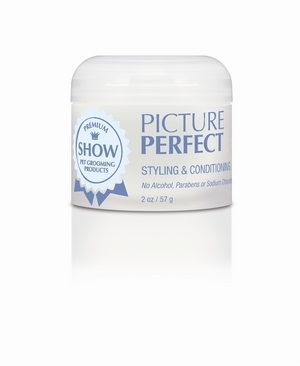 This medium hold, pliable, molding and texturizing paste is ideal for getting a clean, finished look on your pet. Controls and trains the hair with just the right amount of hold while Argan and Coconut Oils help repair, moisturize and add shine. Great for use on the face to keep hair out of the eyes and prevent staining. Perfect for all coat textures. No flaking or stiffness and non-greasy. This stuff is wonderful for holding the flyaway hairs in place - gives you the perfect end result that hair spray just can't accomplish. Still learning how to use this product. Must be doing something right because when I get through my little shih tzu looks like a million dollars. As mentioned, a little on the tips of your index fingers rubbed together does the job. This jar of paste will last quite a while. Great product.Used it after bathing a 3 month old puppy whose coat is still a little on the fluffy side. The coat looked great and we could see that the top line was dead level.